This Laguna Beach candy store carries every kind of treat imaginable- even old-fashioned classic candies that you didn’t think exist anymore! When you enter the doors of The Candy Baron- be prepared to be transported! If you can imagine the inside of Willy Wonka’s Chocolate Factory being an actual place, this is what it would be like! (Buckets of Candy) There are baskets and buckets piled everywhere, packed to the rims with every kind of candy, treat, and novelty that you can imagine. 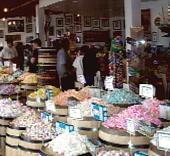 Countless flavors of taffy and licorice flood the baskets. You’ll find endless flavors of sour treats and gummy shapes in this candy store. There are piles and piles of classic treat candies like buttons, pop rocks, Boston baked beans, ring pops, candy necklaces, candy bars, sugar daddies, and even those super-classic wax candies with the juice inside! They also have sugar free candy! I didn’t realize that you could make sugar free chocolate-caramel nougat swirls, but they’ve got them here. This candy store also has sugar free butterscotch buttons, cinnamon treats, taffies, and caramels. The Candy Baron carries every kind of treat to satisfy your sweet tooth! The only question left is- who will love this place more? You or your kids?!? You've given chocolates before, just never like this! 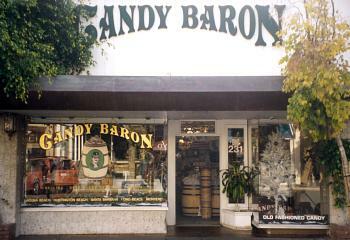 If you're spending the day at Main Beach, Candy Baron is very close!! Cross Coast Highway from Main Beach and start walking up Forest Ave, The Candy Baron Candy Store is on your right side just a few shops up! !